our 8 month old (!!) has learned a new silly face. she loves to make this face randomly though i think it's so cute i am trying to figure out what causes it. for some reason abby grace turning 8 months old seems SO much older than 7 months. can't believe how close we are getting to her 1st bday! i heard this song a few wks ago and became so tearful. it's a great and "so true" song for parenting. it's a country song released a few yrs ago by Darius Rucker (who was the lead singer for hootie and the blowfish) called "it won't be like this for long". hope you enjoy it and hug on your little one all the more! can't believe she will be 8 months old in 3 days!! abby grace is just over 7 months old and is always on the move. she's gained almost 1lb since 6 months and she now weighs 15&1/2 pounds. this is the 1st thing i go after. mimi, lolly, uncle trey, & great aunt marylee visited! i like it better mixed with oatmeal. gave my daddy lots of love on father's day because he's the best! just last week we traveled to visit our friends who are planting a church in seattle. they were on this side of the country so we road-tripped to meet up with them! i'm such a great road-tripper! and this is the 1st time they met! delaney is quite affectionate and we found out that abby grace likes her personal space. kim & i holding each other's babies! it was such a blessing seeing each other! 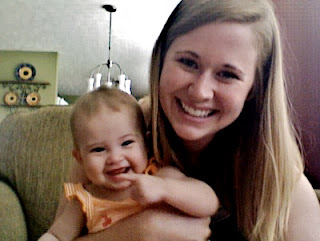 we hadn't met each other babies and it was so fun getting to know delaney's bubbly personality! what a blessed 7 months this has been! so... here's the recap of the last month. THE. REST. OF. THE. WAY. to texas. until we rolled in at about 6am TX time. praise the Lord! she's a little road-tripper like we are - and for that we are sincerely grateful. loved playing with uncle jas! went swimming with nina & big daddy! still not too sure about this whole swimming thing. in texas we started solids! video of her 1st solid bites! she was pretty disgusted. 1 night in tx we were under a tornado warning so i had to wake up abby grace to move her to the pantry. she was a bit out of it & grouchy. in TX abby grace turned 6 months old! she weighed 14lbs 7oz & she was 26.25 inches long. & now in a couple days she's almost 7 months old! i'll post again soon with pics of her sitting up and crawling! pax, abby grace, & abigail playing. poor paxy was in the depths of teething but he still had fun with the girls. abigail trying out abby grace's exersaucer. before abigail (& her parents) arrived, pax and abby grace played some. there's a little clip of them hugging each other which i got a pic of as well. pax was checking out abby grace's teeth since he is in the process of getting some. oh & please excuse all the mommy giggles courtesy of kendall & i.
we are thankful for fun times with friends! abby grace has fallen in love with bouncing. here are a couple videos to prove it. this 1st short video is her 2nd time watching the baby einstein mozart dvd while in her exersaucer. there are parts in this video that she just adores & gets her all bouncy. this is a longer video of her just having fun in her exersaucer. my favorite part is at the end :) she's all smiley and bouncy and full of cuteness. we were gifted a jumper and we can't wait to try that out in texas! im pretty certain she will be hooked! so the past 2 weeks were total madness. it started right after easter... abby grace got sick. but she decided to start teething. at. the. same. time. oh the misery. so, in essence, life gets pretty chaotic. i thanked the Lord for tylenol. you can give it in small doses every 4hrs. literally, at the 3hrs45min mark, she would start getting fussy. thankfully her bottom tooth broke through after about 1.5wks and the tooth right next to it should break through any day now. here she is happy right after easter. but you can tell her eyes are swollen and the madness is about to ensue! poor, pitiful, precious abby grace turned into my little monkey bc she wanted to be held all the time. grateful for my ergo carrier. all better! still some teething going on but for the most part back to normal! abby grace loves looking at books now! my sis, nat, got us this 'beaba' baby food maker - it steams, purees, and reheats baby food so you can make your own! super excited about this! i had planned to start our journey into the world of solids a couple weeks ago but then the madness occurred. so i'll be starting that up real soon. we got together with our good friends, the hintons, and abby grace & pax 'played'. abby grace was definitely interested in watching pax play! abby grace got real tired and assumed her sleeping position. this is how she sleeps, with her hands all tucked underneath her. it's pretty darn cute. so this is my most recent fav pic of abby grace. Less like scars... more like character.